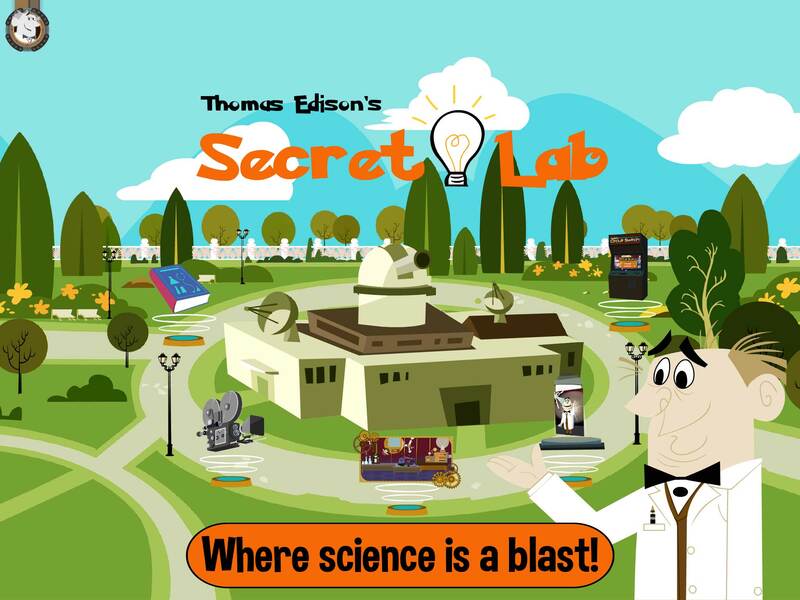 Thomas Edison's Secret Lab is an exciting app full of great educational material shared through fun music videos, interactive games, and entertaining lab experiments that kids will love. Thomas Edison’s Secret Lab is a cute educational app full of great information, experiments, games, and other fun activities for children to enjoy. Not only do players have the chance to learn about various inventors and scientists, but they can also enjoy scientific music videos and meet some of Edison’s virtual team. Interactive and lots of fun. There is no doubt that the developers have done an excellent job creating fun images and illustrations for children to enjoy in this app. Each section has it’s own bit of high quality magic that offers interactive and entertaining images and activities. The user interface is easy to use and allows players to move through at their own pace. The developers have also included a bit of an introduction to give players some insight into how the app works and what they can expect. Overall, it’s very well done. When it comes to educational value, this app is great! Not only will children have the chance to learn about Thomas Edison and his contributions to science, but they also get to learn about other scientists including Benjamin Franklin, Marie Curie, Sir Isaac Newton and many more. For each scientist players will learn about inventions and discoveries, their biography, a fun fact, and a famous quote. There is also a videos section of the app that allows children to learn fun science concepts through entertaining music videos. And if that isn’t enough, the experiments section provides four experiments that users can try at home (with parental supervision) for a little hands on learning. Priced at just under a dollar this app is a steal! When you consider all of the educational and engaging material that is included, this app offers a ton of value. Parents will certainly be happy with the price and all that this app entails. The developers have done an excellent job with the visuals, activities, educational material and games presented in this app. One thing parents will want to be aware of if they are using an iPad 2 device is that in order to access the games section players are taken through an (unprotected) external link to the website where the games are located. All other devices include the games within the device which is perfect. It would be nice to have a simple gateway to protect users who might be using an iPad 2, however for users using newer models this is not an issue.